Enter the misguided character, Only Kinda Racist Cop. Ah, a new day, a new terrible thing on the internet. Yes, it is with a heavy heart that I must announce that the brands are at it again. Overnight, popular carbonated sugar water company Pepsi released their new advert featuring known attractive person Kendall Jenner. Yes, we see Kendall doing some modelling, before a passing protester gives her a cheeky inclusive wink, and she puts the trappings of capitalism away to go on a march. There, she sees a police officer giving a black protester a dirty look. She offers him a delicious Pepsi©. He drinks the Pepsi, and smiles, for racism is now dead. 1. Why is Kendall Jenner doing a shoot in a random doorway? What is it for? Homebase? Wickes? 3. The signs, oh good God, the utterly meaningless signs. “LoVE”, “PEACE”, “uniTY”, the real kicker, “Join The conversation!” (How long do we think it will be before Pepsi responds to the backlash by saying “We wanted to spark a conversation, so thanks to all who engaged with out message.”) There’s also one that looks like a no entry sign behind a blue heart? What does that mean? No love?! I’m getting mixed messages here, guys. 4. Kendall looks at the crowd – her interest is immediately piqued. I’m not sure why, because those generic signs give absolutely no clue as to what they could be fighting for. This could be an anti-Kardashian protest for all Kendall knows. But it is of no consequence. Literally just seeing unspecified protests is enough for Kendall to get involved, she doesn’t give a flying one what it’s for, she just wants to get those heels on the concrete. She is a protest junkie. 5. So moved is Kendall that she immediately whips off her blonde wig and throws it at the nearest black woman. She can deal with it, right? Like, what else would she be here for? 6. The blonde wig reveals an identical haircut, but brown, because everyone knows brown hair is more serious. 7. She smudges her purple lipstick across her face, dramatically. How did that help anything, Kendall. Calm down. 8. The signs get even stupider. Because Pepsi wants to, like, be as cool as protesting, but not with any of that weird divisive stuff like “women and black people are human beings, too”. 9. Enter misguided character: Only Kinda Racist Cop. 10. Kendall has miraculously changed into a totally new outfit (we call this look, “I’m just like you, but better!”) complete with perfect make up and pale pink lipstick. This is not what happens when you rub purple lipstick all over your face, kids. Just FYI. 13. Which, of course, Only Kinda Racist Cop hates. 14. But Kendall spots his racism a mile off (see: cool white). Don’t worry, civil rights movements. Kendall’s got this. 15. 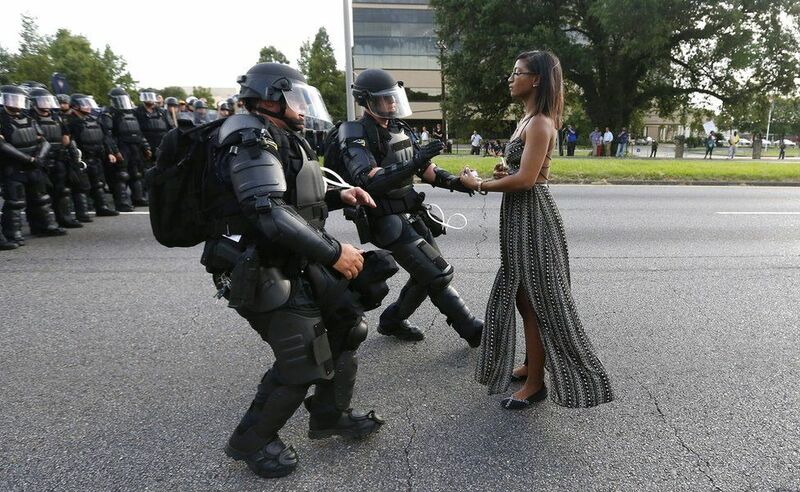 The nearest woman of colour immediately begins to document this moment of white heroism. Like, what else would she be here for? 16. Kendall approaches the (inexplicably non-armed?!) police in a scene reminiscent of a famous #BlackLivesMatter image, only this time, your Friendly Neighbourhood Only Kinda Racist Cops are not armed (wow, armed, police, that would be scary! ), Kendall Jenner is here instead, and there is no actual cause to speak of. 17. Only Kinda Racist Cop sips a cool refreshing Pepsi Max©, and the crowd goes wild. 18. Truly, world peace has been achieved at last. 20. Live BOLDER, okay? Be MORE cheeky in your interactions with the police! Approach them MORE recklessly! Everything Will Be Fine (As Long As You’re White)! 21. Please tell me who thought “Live For Now” would be a good slogan for a drinks campaign riffing on police brutality. 22. That encourages interactions with the police. 23. In a country where minorities are murdered by the police. If you spot any more glaring horrors – please do add them to the list.